You're stepping up to make an important putt, upshot or short drive. You feel the wind messing with your head. Grab the Caltrop and feel confidence return. 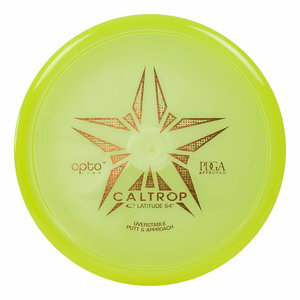 The Caltrop is a throwing putter with raised thumb grip and solid overstable flight that will help you make those critical shots to stay in the lead. Now available in Opto Line.